The Sleeper and The Spindle was everything I wanted and more. 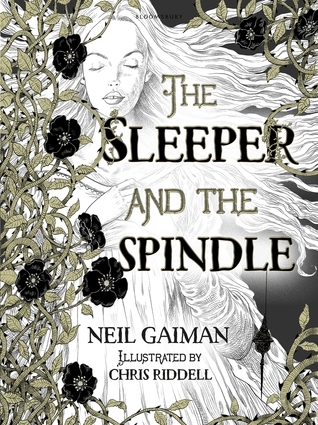 Filled with breathtaking illustrations by Chris Riddell with luxurious gold detailings – along with Neil Gaiman’s masterful and lyrical writing; it’s a definite winner. At 66 pages, it’s a bit tough for me to review this beauty, so I’ll let you determine whether you should purchase the book based on the questions below. If any of these questions have ever crossed your mind after reading a fairy tale, you need this book! Ever wondered what happened to Snow White after she was woke from her slumber? Was she grateful for the prince, or did she really have no choice in the matter? The Queen that Neil Gaiman and Chris Riddell illustrate is filled with misgivings about her upcoming marriage. She’s not content to be bound to a life of domestic servitude (the lady has spent long enough sweeping and cleaning after seven dwarfs, after all) – she’s going to embark on an adventure to save a damsel from distress instead. She called for provisions, and for her horse, and she rode out of the palace, towards the east. Ever questioned why only princes get to do the saving? Why must the prince be the one to slay witches and dragons? Why must they be the one to bestow us with the magical true love’s kiss? This gorgeous book is free from any male authoritative figures and romance. Truly a fairy tale I would be proud to tell my own daughters (and sons!) in the future. The Queen had a name, but nowadays people only ever called her Your Majesty. Names are in short supply in this retelling. Have you ever grumbled about the predictability of fairy tales? Why should we guess the ending long before the last pages are turned? There’s a couple of neat twists in this short tale, and while they’re not completely unexpected – they’re certainly a refreshing change from the usual bedtime stories. Have you ever pondered how final the words ‘happily ever after’ are? I’ve always been frustrated by how those three words closed the story so resolutely. I want the characters I read about to have lives that extends beyond the telling – and I certainly got that satisfaction here. This is definitely a book I would recommend to anyone who loves fairy tales. To anyone who loves beautiful art. To anyone that’s ever asked the questions above. Have you read this gorgeous tale? What did you think? ‹ PreviousDiscussion: Is It Possible To Measure Blogging Success? I’m definitely gonna read this book now because it looks absolutely beautiful! Yes, it’s absolutely gorgeous, I hope you’ll love it as much I did! I have NOT read this beauty but I certainly will SOON. I love everything by this author! And god your review is just as gorgeous, Aentee! I’m so relieved you liked this! I love this book! It made me crave for more. I still haven’t read anything else by Neil Gaiman yet so I don’t know how close this book is to his usual style. But I really enjoyed it and it’s short too. I don’t think there’s anything too scary or inappropriate. Some of the illustrations could potentially be a bit scary for a 4 year old but nothing too freaky. It also depends how attached your little booknerd is to the classic/Disney Snow White and Sleeping Beauty. There are quite a few twists in there. She is totally not attached at all to the originals and actually likes slightly scary/spooky stuff. Lol, which I know she didn’t get from me! I think October is her favorite month bc of Halloween. Thanks for the insight! I really appreciate it! Oooo the world if Gaiman is wonderful. I think if you liked this one, the perfect follow up would be Stardust! It’s a great adult type fairy tale. I also really enjoyed Anansi Boys! I’ll definitely give Stardust a go… when I stop feeling bad about buying books again. I’ve been meaning to pick up The Ocean at the End of the Lane because everybody raves about that one and it’s short but every time I see it, there are other ones I want to buy T_T I also want to give his other illustrated books a go, especially The Graveyard Book. Might be fitting to read it in October as well. Aentee! OMG, I love all the questions!! Seriously how do you keep blowing my mind all the time!?!?! Thanks to you and Jenna, I am putting this on my TBR with hopeful anticipation! I love subverting tropes and the promise of no princes saving anyone sounds kickass! Thank you so much for the nomination and I hope you enjoy The Sleeper and The Spindle if you get a chance to read it! Definitely a great fairy tale retelling, very quick but utterly gorgeous read – definitely a book worth owning!! I think my favourite Neil Gaiman books were his Sandman graphic novels, Stardust and Anansi Boys! This one or Coraline is a great introduction to his work though. Thanks, he’s a great author, hope you get a chance to check out some of his stuff soon. I am also one of the fairy tale retellings junkies and I adored this book! Hope you’ll get a chance to read it. Ah, it looks and sounds utterly gorgeous. And I’m all for fairy tales with powerful women and twists. Will keep my eye out for this one! Definitely a short but quite powerful book, I think you’ll enjoy it a lot so I hope you’ll get a chance to check it out soon! Ooo I do remember, you read Snow, Glass and Apple right? This book is very similar to it! The illustrations…. *fangirling silently* ❤ Really, Aentee…everytime I read your blog, my reading list always going to grow because you always bringing the interesting point from what you read. Ooo Beastkeeper sounds absolutely amazing! I need to check it out soon! I hope you find this one Val, it’s utterly gorgeous both in presentation and in writing! So excited to read this book! Neil Gaiman is one of my all-time favorite authors. Beautiful review!! I adore him as well, although all of his books are speculative fiction they are all so different from one another. He keeps surprising me! I want this book. I love Neil Gaiman so much. I hope he reads this to his new baby and raises a beautiful feminist son! Ah I had no idea his new baby with Amanda was already due! I am sure they will raise her into an amazing human. What a fabulous review, Aentee! I haven’t read a single Neil Gaiman book yet (I know, how shameful!) but when I do so, this will definitely be the one I consider. Thank you Rachel! A good Neil Gaiman book to start with would be Coraline, The Graveyard Book or Anansi Boys :D! Hope you’ll get to enjoy his magical books soon! I’ve think I’ve seen the movie for Coraline – that’s the creepy kid’s movie with the character that have buttons for eyes, right? If so, I’ll probably try that one first. I hope so too! Yes that’s the one! Have fun with it! It’s a great Halloween read. Hi Aentee! Great review, just a quick question about your blog. We’re both running the same theme and so it should be the same, but how do you get the front page to only show an excerpt or snippet of your posts instead of the whole thing? My blog shows each completely post and it can be quite draining to scroll through all my posts. When you are editing or composing your post there’s a button on the formatting bar that says ‘read more’. You insert that wherever you want the post to cut off on the main page. Ohhhhhhh… Thank you so much!! Fairytale retellings always speak to me. Fantastic review + use of quotes + captions + images. The art is telling me that I must read this book. My friend sent me a copy of Gaiman’s retelling of Hansel and Gretel. I’ll start there but I’ll be on the look out for a subversion of a princess’ tale. Glad you approve, Glaiza! I had no idea Gaiman had a Hansel and Gretel retelling though, I must look into it! Wonderful review, Aentee! I love this format with questions. You definitely made me want to pick up this book. Is it your own graphics or illustrations from the book? OH MY GOSH I NEED THIS BOOK NOW. THOSE QUESTIONS – YES! THAT ART -YES! You just confirmed what I thought. I need to read this book yesterday. I have read every Neil Gaiman books and he is one of my favorite authors. I don’t know why I even had doubts about reading his new release, but I don’t anymore, thanks to you!